La empresa minera estadounidense Kappes, Cassidy & Associates (KCA) y su subsidiaria guatemalteca han insistido en ir adelante con el proyecto minero El Tambor pese a la oposición fuerte y sin consultar con los vecinos sobre el proyecto como requiere la ley guatemalteca e internacional. Ahora, el 15 de julio, falló una corte guatemalteca a favor de los residentes ordenando la suspensión de construcción de parte de KCA en la mina de oro El Tambor hasta que se realice una consulta de vecinos y el proyecto sea aprobado por los residentes. La corte ordenó que el municipio donde se ubica la mina asegure que EXMINGUA, la filial de KCA, cumpla con la orden dentro de 15 días. At our public event in Reno, we will hear from Miriam Pixtún Monroy, a Maya Kaqchikel woman from San José Nacahuil, San Pedro Ayampuc in Guatemala and Teresa Muñoz, an anti-mining activist from Jalapa, Guatemala. We will also present a letter to the Nevada Mining Association alerting them to human rights abuses in Guatemala at mines owned by Kappes, Cassiday & Associates. We will demand that the Nevada Mining Association take action on this member company to expel Kappes, Cassiday & Associates from the Association as long as these abuses continue. Furthermore, we will urge the Association to require its members to uphold the highest human rights standards, and to deny any future membership to companies that violate human rights, like Nevada-based Tahoe Resources. 2. Tweeting at the Nevada Mining Association during our delivery of the letter on Thursday, November 13th. 3. Leaving a message for the president of the Nevada Mining Association on Thursday, November 13th (tomorrow!) at 775-829-2121. Sample SHORT script: Hi, my name is ________ and I’m calling from [state]. I’m calling to let Mr. Tim Crowley know that I support residents of Nevada in calling for you to revoke the membership of Kappes, Cassiday & Associates. All US companies should uphold the highest human rights and environmental standards, and the Nevada Mining Association should deny membership to those who don’t, like KCA. Hi, my name is ________ and I’m calling from [state]. I’m calling to leave a message for Mr. Tim Crowley. I’ve been shocked to hear that US companies, including members of the Nevada Mining Association, have continued their operations in Guatemala despite ongoing human rights violations. Right now in Congress, our elected officials are considering lifting important protections for migrant children currently provided under the Trafficking Victims Protection and Reauthorization Act of 2008 (TVPRA) — a law which requires children to have a hearing before a judge and to have an attorney present. We must demand that our elected officials ensure the safety of children arriving at the US border. Adding muscle to the Guatemalan military? Defense Secretary Chuck Hagel heads to Guatemala this week to “add muscle and sinew” to defense ties between that country and the United States and highlight the importance of helping partner nations improve their militaries. However, a recently released United Nations 2013 Global Study on Homicide offered alternative methods of combating the violence plaguing Guatemala. Besides Hagel’s trip, Guatemala has received various high level visits from US officials over the last several months focused on security cooperation, including General John Kelly, head of US Southern Command, and Assistant Secretary for International Narcotics and Law Enforcement Affairs, William Brownfield. The increased attention has corresponded with an increase in security assistance as well. Guatemala jumped to the third highest country recipient of Department of Defense military and police aid in Latin America in 2012. 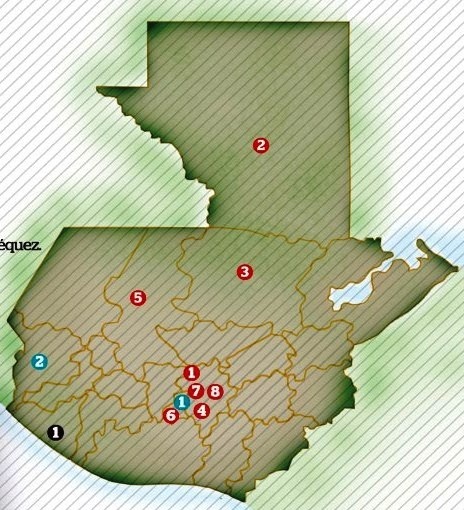 The US State Department has also provided significant funding to a joint task force on Guatemala’s northern border with Mexico, and has donated 42 vehicles to a recently announced base on Guatemala’s southern border with Honduras. Urgent! Communities in Huehuetenango are under siege by Guatemalan military and police. The security forces were sent to break up peaceful protests in reaction to the illegal detention of a local resident. Several people have already been injured and we fear that there could be further violence. Please call the Guatemalan Embassy to express concern about the safety of peaceful protesters in Huehuetenango. Urge the Guatemalan government to avoid further conflict, uphold the rule of law and respect human rights. In the US: 202-745-4953. In Canada: 613-233-7188. Please tweet at the Guatemalan government to ask them to avoid further conflict and ensure the human rights of peaceful protesters. Suggested tweets (with translations to English) are below. On Sept. 28, Mynor López, who has been active in the resistance movement, was seized by men in civilian clothes, taken to a military helicopter, then handed over to the police. In response to the abduction, protests erupted across northern Huehuetenango, blocking various roads. The government mobilized hundreds of police and soldiers to break up the protests using tear gas launched from army helicopters as well as live rounds fired by security forces. A soldier was killed in the clashes. Despite evidence that his injuries were self-inflicted while attempting to fire a tear gas canister, the government publicly blamed protesters for his death. In addition, the Interior Minister announced that 40 arrest warrants would be carried out for various acts allegedly committed since 2011. Over the past year and a half, over a dozen community members have been arrested for their resistance to the Canbalam Dam. Several of them were incarcerated for up to eight months before being released because of a lack of evidence against them. A delegation organized by the International Commission of Jurists visited Mynor in jail and report that he shows evidence of physical violence, even torture. Community members are now asking the government to respect an agreement reached on September 30 to withdraw security forces and have a real dialogue regarding the proposed hydroelectric dam. Can you stand with them and help prevent further bloodshed? @GuatemalaGob Respeten los #derechoshumanos en Huehue #Guatemala. Cese la violencia contra las manifestaciones pacificas. On Saturday, we at GHRC had the pleasure of taking part in a powerful art installation in Washington, DC. 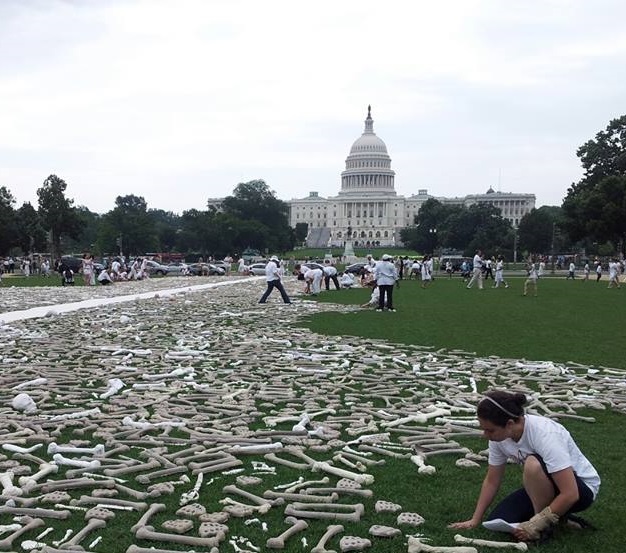 After three years of preparation, the organization One Million Bones blanketed a section of the National Mall with bones made of various materials to bring attention to genocide committed around the world. The organizers of One Million Bones had extended a special invitation to GHRC and the Guatemala community to take part and commemorate Guatemala’s genocide victims. GHRC staff, interns and volunteers, joined thousands of others in laying out the bones. Our group took the opportunity to read the names of the victims in the Ixil Triangle included in the charges against former generals Ríos Montt and Rodríguez Sánchez. We posted a photo of the event on our Facebook page on Saturday afternoon, and were shocked to see the response. Our wall was covered by an energetic debate about genocide in Guatemala. It was heartwarming to see all the comments in support of justice for victims, but sad to see that there were also many comments full of hate, anger, and denial of the crimes committed against Guatemala’s indigenous people. Unfortunately, many of the people who posted on our wall are the same people who have been spreading the same messages of hate and denial in the Guatemalan media and organizing protests in support of those who committed atrocities.